FIGYELEM! 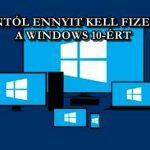 KINYÍRJA A WINDOWST AZ ÚJ FRISSÍTÉS! TÖRÖLD!